Mumbai, July 31, 2017: A short circuit in your electrical switch board or panel box takes mere 30 seconds for a small flame to get completely out of control. How then can you protect your property and life? PyroSecure, a brand owned by DNY Hospitality Pvt Ltd, has the solution to no more fire accidents due to short circuits. It has launched two unique technology products called PyroSticker and PyroCord to kill the fire at the source of a short circuit. “Our product is a revolutionary new technology designed to protect against fire arising out of electrical short circuits. Manufactured using Nano Technology, it is easy to install, operates automatically and comes with 5 year warranty,” added Dalwani. 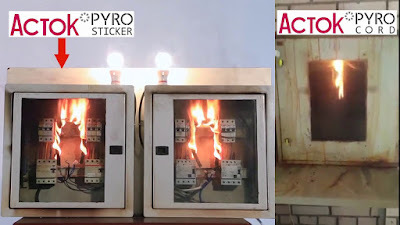 PyroSticker is a miniature, self- contained, automatic, local fire suppressant product. It comes in different sizes for different switch boards and electrical panel boxes and does not require servicing or maintenance. While, PyroCord has a feature of fire detection, fire extinguishing and fire announcement. It prevents repeated ignition in protected space for upto 30 minutes and is designed for protection of bigger units, boxes and places where PyroSticker could not be installed. Both are completely non-toxic and safe for children. It is a need of the hour in places like residential complexes, schools, hospitals, malls, theatres, fuel stations, hotels & resorts, office & commercial buildings, etc. The products are certified by local and international agencies of repute and have also won several international awards.